Happy New Year, Hubbers! I hope you had a wonderful holiday season. As we get back into the swing of things at HubPages HQ, I want to share a bit about what’s in store this upcoming year. Our focus continues to be on improving the overall quality and health of the site. To that end, I’d like to talk about product capsules. Our policies on product capsules have become stricter over the years, and we will continue to tighten the rules on how products can be used on HubPages. At this point we have definitive evidence that on average, Hubs with fewer words per product have less satisfied readers. 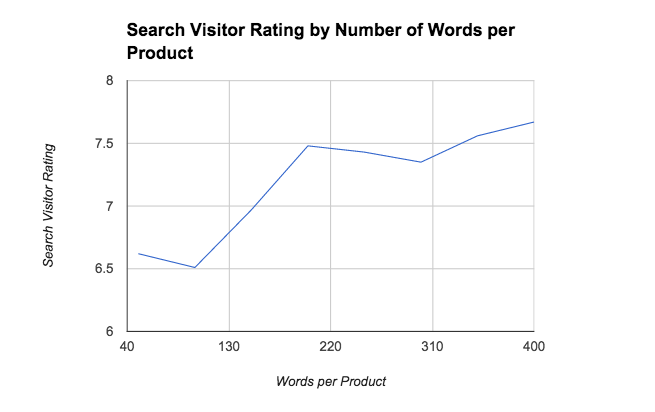 This graph shows the average search visitor rating (1-10, “How good is this article?”) by words per product. Thus one of the biggest changes we implemented recently was in the way that the Quality Assessment Process evaluates product-oriented Hubs. If you’re not familiar with the phrase “spammy elements” by now, you should be! Spammy elements are things— products, links, text— that tend to make Hubs (even totally innocent ones) spammy, regardless of the intent of the author. OK, so what do these points mean? The first two are related to one another and have more to do with the content in product Hubs than the product capsules themselves. If you include products in your Hubs, make sure that they supplement your content and not the other way around. One litmus test you could run is this: if you were to remove all of the product capsules from your Hub, would the remaining content satisfy your readers? Would the Hub even make sense? If not, you know you’ve got a problem. The last two bullet points above are probably familiar rules, but they continue to be important. When we use the word “excessive” we are not thinking of a magic number or a specific Hub-to-content ratio. It all depends on context. A Hub may have 20 products and still be excellent (admittedly, it would take a lot of work). In general, though, you should avoid placing description-less products in big blocks (e.g., two or more in a row). This makes Hubs appear spammy even if they aren’t. Similarly, only use products that are directly related to your Hub’s content— or, in many cases— to the reader’s search query. For more tips on best practices, please check out the Appropriate Use of Product Capsules section of the HubPages Style Guide. Only include products that are directly mentioned in the Hub, recommended by you in context, and useful to the reader. Ask yourself: if you were a reader, would you want to be shown this product and would it be valuable to you? In a Hub that’s a curated list (“The Best Ski Poles for Kids”), you should show first-hand knowledge about the items on the list (the different ski poles and their nuances). Simply researching the topic and pulling information from Amazon or other sources is not enough. Curated lists with products need information that comes from hands-on or unique experience. To further help illustrate the difference between spammy product Hubs and OK product Hubs, we have compiled a list of examples. The spammy product Hubs were specially created by HubPages’ moderators, and you may recognize some of the authors of the OK product Hubs as successful fellow Hubbers. We hope those example Hubs are helpful. Next, we invite you to discuss and ask questions in this staff-monitored forum thread. Paul E, Robin, and I will be around to answer your questions. Thanks for your help keeping HubPages awesome and spam-free in 2015! How much time do we have to revise our work before we risk a hub getting unfeatured? It would be nice to get a timeline on this. I have hundreds of hubs. Long ago I wrote a product review hub based on my experiences, and from time to time I updated it as I got updates. My computer can’t run the latest version, so my article is getting more and more outdated. Is it OK to keep a product hub published long after the model or version of the product described and discussed is behind the times? Looking at your reader satisfaction/words per product data, it would seem there is an extremely strong case for HubPages to increase the number of words required per product capsule. Why isn’t that being considered?